This gift basket, brimming with gourmet delights, is ideal to send to a client, business associate, or any man on your list with a sophisticated palate. In this classic gift container, he'll find dark chocolate key lime truffles, an orange-liquor chocolate spread (great on ice cream), an array of delectable cookies, assorted teas, pretzels, crackers, chunky antipasto cracker spread, popcorn and popcorn seasoning. 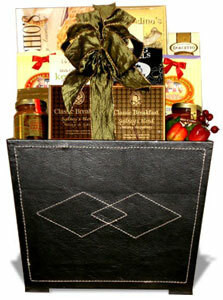 When you want a gift basket that is sure to impress, send the Executive Classic Gift Basket. PLEASE NOTE gift packaging and the exact brands of products may vary depending on delivery location.